- to raise fund and support the current project - working with Helping Hands Group - on providing roofs and package of goods (rice, kalah beans, mat, blanket, dan-oh/pot) to 450 households/huts (1900 people) in villages near Bogalay. Each package is estimated at $40. There were more than 30 Burmese home-made dishes and desserts donated by individual donors and chefs. Over 70 volunteers had joined this effort from planning, organizing, advertising, preparing delicious dishes, setting up the halls and exhibitions, helping at the booths to finally cleaning up. The success of this event is credited to the team work of all volunteers, donors and supporters (visitors). Together, we raised $8,100 and we had connected with each other for a common purpose. Many thanks to volunteers, donors and supporters (visitors) for joining the effort! Together, we can make a difference! - Please see our menu, donors and volunteers list here. Please forgive us and let us know if we miss any names in the list. - One of the guests wrote about the Food Bazaar at his blog. He also posted photos there. The UN Office for the Coordination of Humanitarian Affairs (OCHA) and the Integrated Regional Information Network (IRIN), a leading provider of multimedia humanitarian news and analysis, wrote an article on Moegyo Humanitarian Foundation. BANGKOK, 26 June 2008 (IRIN) - “Moegyo stands for thunder and lightning. Our humanitarian foundation responded to Cyclone Nargis with the speed of lightning,” said Maung Thant (not his real name), a Burmese national living and working in Bangkok, who does not want to be identified. He is one of 20 Burmese members of the Moegyo Humanitarian Foundation, most based in New York City, with three in Bangkok. Moegyo is a kind of fast-reaction assistance force, although small of scale. At the time of the December 2004 tsunami, it helped Burmese refugees injured in Phuket in southern Thailand. No more sad stories! I told myself this, as I sat down to start my field trip report on Monday. Every time we go on field trips, we hear personal stories that are heart breaking. I thought, this time, I will not write about them because sharing sad stories are not the same as sharing happy stories. Besides, people must have heard these stories a thousand times already. What has happened to me since I came back was I could not shake some of these people out of my head; their dark sunburn faces, their words, and their sad stories followed me everywhere. I don't want to forget about them, but I needed something to get me out of this sorrow. I have to get on with my daily life in Yangon, I have to focus and collect more information so I can again organize another trip to Bogalay in the coming days. I just needed something to make me to move on. Last night, I was still thinking about them when I suddenly realized that writing about these people is exactly what I needed to do if I need to move on. The interesting thing is this answer came from the survivors I had talked to. I understand now that they were, too, trying to move on when they told me about their beloved families who lost their lives during the cyclone, their pain and suffering, and the present challenges they face alone without their families. As for me, writing about these survivors will mean understanding their pain, acknowledging their loss, and showing them we care. I hope I had helped them in their healing process even if in small ways. 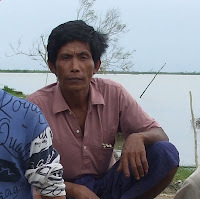 On the evening of May 2, when the water level was coming up so fast and so high in the village, Mr. H.A and his wife decided that the wife and their 3 daughters will seek the shelter in the long-tail boat along with other villagers. H.A. watched them leave, and stayed back. He later climbed up to the highest part in their compound where they build the rice storage container and held on tight to the wooden beam. The wind and the 15 feet waves pouring in later on that night, sweeping everything that he was holding onto. He then spent another seemingly eternity time floating in the dark, holding on a tree and shivering from cold. He remembered thinking at least his family will be safe. Unfortunately, he was wrong. He later had to accept that the boat might have broken out and let loose all of its passengers, mainly small children and women, into the water, in the pitch dark. He did not recover any of his family members. H.A. is now residing back in his village which is about 2 hour boat ride away from Bogalay. He lives with two nephews. His family, his sister, his brother and their extended families are all gone. These three men are trying to start over. They want to work. They have worked hard all their lives anyway. H.A. owns about 20 acres of rice plantation. He is not a poor person at all. But after the cyclone Nargis, everybody in delta is starting from bottom line again. H.A. said sometimes he finds little motivation to work; previously, he has worked hard with some greed to earn a lot of money; to let his daughters to attend school; and to buy his wife some new accessories here and there. Now, he has to find a reason to work other than paying back for the loan that he made to borrow a pair of buffaloes. If he hurries, he will make it in time to produce enough seeds for next season and pay back for the buffaloes. Mr. N.T. lived about 3 hour boat ride from Bogalay. On that fateful night, when the rising water level reached above their knees, it was already difficult enough to walk or to stand still as the current was very strong. When the water level reached their waist, the whole family of seven scattered into the night. He could hold onto the youngest son, 6 years old, throughout the night. From time to time, in the wind, he called out to his son to make sure that the kid knows he was there. The last word he heard from the boy were that he was afraid. Sometime in the night, N.T. realized that his son has died. But he did not have the heart to let him go, so, he hold onto him and held on an empty plastic fuel container and float in the water. In the daylight the next morning, he buried his son on an island that he ended up on. He was there for 2 days, eating coconut flesh and drinking coconut juice. He lived in this delta area all of his life, but nothing he saw on the sight was recognizable. He could only guess he must be very close to the sea. Upon his return back to town on a rescue boat, he reunited with his 14 year old daughter and later on with another son. The rest of the family was never discovered. N.T. now resides in Bogalay with his children. He does not see any reason to go back to the village since his family and all he owned is gone. 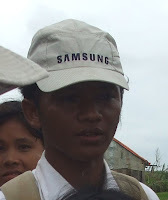 He has spent his life working in rice plantation. But in town, he may have to change his profession. He is tempting his hobby at building to turn it into a job. He will work at it. During the trip, we stopped by at his village, donated the goods. As we departed the village, our volunteer group, who have listened to his personal story, were silent. We somehow felt what it must have been like. N.T. just stared into the distant and did not say a word. During this trip, we went to the villages that are around 3-4 hour boat ride away from Bogalay. We have visited 6 villages and reached 408 families. We have provided rice, salt, fish paste, canned fish, children's snacks, dry tea leaf and Burmese medicines to all families; and torch lights with batteries, towels, clothing, mosquito nets, blankets, school materials, rain cover sheets and house building tools to the families that needed them. We had intended to distribute the school materials and planned to set aside time for the children on this trip. We were a little bit surprised to see that there were not so many kids in the villages that we visited (compare to other parts of the country). We found out that some children passed away, some relocated, some sent to town for studying and etc. The local volunteer group has collected the numbers that approximate 400 students in two primary schools in Bogalay were in need of text books, school materials and uniforms. Some of those students came from the villages as the schools in the villages were not ready. We gave all the school materials to the volunteers as we have no time to do this ourselves in Bogalay. We will report back to you with the photos of these school children in Bogalay. To the village kids, we continued distributing stuff toys, jigsaw puzzles, and story books. Due to long distant, tides, and upstream travel on both ways, we could spend only 30-45 minutes in each village. The rest of the total 13 hour boat ride was spent on the boat. The long distant also meant that we have reached to the small villages that needed some assistant. 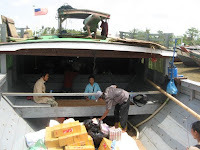 We were so glad to see one mobile medical team on the boat traveling to different villages. Bogalay and delta region were the main producers of high quality rice for the whole country before. We are sure this fertile land will get back to its original productive state again in the future. And the farmers will be well-off again when that happens. However, before we reach that stage, the farmers and the families working on farms will need our help in many ways. While some are weak and dependent on aids, most of them are strong, and independent. And these survivors WILL find ways to survive with or without our help. But when the magnitude of loss and sufferings is this high, let's not watch them struggle, let's offer our hands to help them get back on their feet; let's offer our ears to listen to what they have to say to us; let's open our hearts to them. They have carried 25 mosquito nets from us. Have distributed them in a village near Bogalay and one village near Kun-chan-gone Township. Other stuff they donated from other donors include 3 plowing machines, cash donation for fuel, saw, hammers, Burmese medicines (villagers find them more useful as they are not too familiar with foreign medicines) and some school materials. 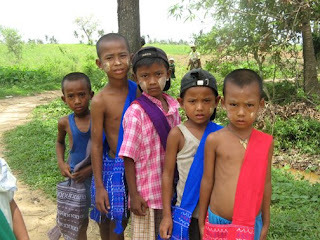 Their next trip is planned to Lat-put-ta and nearby villages, traveling starts on 22 June. Group is on a trip to Bogalay and nearby villages. They are carrying mosquito nets, blankets and fish cans for 250 families in the area. For all of yesterday and today, my mind is with this group and I have been saying prayers for them. There is a storm passing through the same area that they are going. The forecast says that the wind is about 50 miles/hour. And Yangon has been raining too most of the days without a drop of any sunshine. Our group is aware of the coming storm and high tides. They will be wearing life jackets, so I am sure they are safe and have taken any necessary precautions to travel through these rivers and in between the villages. But I will be able to rest when I check in with them again tomorrow morning. Will keep you updated on this. It has been some tough weeks for our Budget Hut Building Group (NLS group). This volunteer group is emotionally strong and committed. They have the will to go on as long as there is funding available to them. But let's face it, these guys have been staying in Latputta for weeks. They have not eaten proper meal for days. And one attack they are facing is from mosquitoes. They are a bit tired, and they need some medicines to take care of the mosquito bites on their legs and arms. They have tried using mosquito repellent, but nothing works so far. We have to do something to take care of our volunteers working in the front lines. We have chosen a site for building budget huts under MHF funding. The village is under the administration of Latputta Township. It can take about 7-8 hours to reach Latputta. From Laputta, you can continue the trip by boat. Each way takes about 2 and a half hours. This village has about 200 people left after the cyclone. We have taken the available family listings and calculated that about 25 huts are needed to house the people without any place to live. These 25 huts will be safe accommodation for some 88 people when all the huts are completed. Among 25 huts, some will be occupied by whole families, some are to be occupied by survivors from different families. With funding from MHF, we have bought nails, ropes, wooden planks, saw, staple gun, hummer, and tarpaulin sheets for roofing. And the villagers build the huts together. The targeted 25 huts are about to be finished. But June and July are the busy periods for people who live around here. Their routine livelihood is still important to carry on under these circumstances. So, the villagers have been both working in the field and building the huts for themselves and the neighbors around them. We will try to update with the recent photos as soon as we have them taken. - The cost will go up because the supply of wood is getting scarce in the village. In Latputta, normal hard woods are not available anymore. Either you buy better quality hard wood or import from another town with high transportation cost. - We need to find ways to support the villagers and volunteers with their daily routine and living while they work on the huts. - Mosquitoes have serious impact on health. It is going to be a long term battle to get to the root causes. Meanwhile, we will try sending different brands of mosquito repellent sprays. Any suggestions are welcomed. - There are plenty of migrations going on among the villages and there are many requests by the villagers to NLS group to help them build a home. NLS group has the will to carry on as long as there is funding. They need continue support from all of us. Based on our previous reports, we went back to Nyaung Waing village in Kyank Tan Area and donated US$100 each to four families identified as the poorest in the village. The families were struggling to survive and unable to rebuild their homes after the Cyclone. Old widow with one son: Bamboo and woods were still piling on the ground as they could not afford to rebuild the home. A family with 6 young children: They depend on ad-hoc jobs for their living. Their home, a small bamboo hut lost the back wall and back roof during the Cyclone. As they could not afford to rebuild their home, they replaced the wall and roof temporarily with some blankets. A widow with two young sons: She lost her husband during the Cyclone. They make their living by delivering water. They live in a very small bamboo hut that is temporally mended by bamboo sticks and strings. The widow cried with joy when she received our donations. A family also with 6 very young children: Their youngest child is about a year old. They were living in a temporarily built 7x7 feet bamboo hut that seemed to be falling apart. They depend on ad-hoc jobs for their living. They were crying as they explained their dilemma and expressed their sincere appreciation to all of us and said that they will always be praying for all of us and all the donors. There are still about 46 families struggling to survive in the area who need support in rebuilding their lives. Last weekend, there was a fundraising at a monastery in Maryland for Myanmar relief. MOEGYO volunteers in the DC Metro area had participated in this fare and helped promote the work of MOEGYO and raise fund with T-shirts, wrist bands, tote bags and burmese snacks. Some of us from NY also joined the effort. We sincerely appreciated our local group for their commitment and hard work especially under that heat wave. Thank you very much Ko TT, Zu Zu, Ma Pann and her mom, Richard, Ko Bo, Phowa, Ma Joe Phyu, Ko Thu Rein and everyone helping at the booth! There will also be another fare at Aung Yadana Monastery in Maryland this Sunday. Our local group plan to be there as well. Thank you all donors and supporters for joining the relief effort. Together we can make a difference! -Left Yangon quite late and had to catch the flight in the evening. - So, decided to drive through the main road, where saw some cars from Save the Children went into off-main road. - At one monastery (badly damaged), saw some people/crowd and decided to stop-over and check. 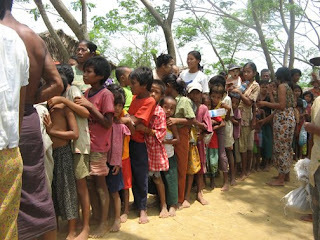 -There were about 150 Nyaung Wine villagers (Kyaut Tan township) and some donors distributing food and clothes. -Asked villagers of their needs and as usual they replied that they are quite OK in terms of food, clothes and shelter(I doubt though), but they want someone to assist rebuilding of their neighbors' houses (about 4 of them). That truly shows the selfless nature of our people. - Each house will cost about 100,000 kyats. - Kyaut Tan-Ye Le Pagoda area was pretty quiet with only a few visitors. Some people there said the monasteries need donations. - Due to time-pressure, had to head back to Yangon. Wish had more time to visit the villages. Our group, 45 of us woke up at 3am on 1.6.08 and started the trip to Ayeyarwadi division. We went to 4 villages in Phar Pone Township. We divided ourselves into 2 groups and each group visited 2 villages. We came back to Yangon at 1:30am the next day 2.6.08. June 3rd 2008: How can we help children cope with the trauma? We would like to focus mainly on providing with school materials for the kids. There is still time because school starting dates are postponed for the effected areas. The adults are going to adjust to the recent changes in their lives. The kids are also going to. But without the right channel and care, their adjustment can be harsh and painful for their minds. So, in addition to helping them with obvious material needs such as school materials, building schools and huts/houses etc, there must be some further care we can offer to them. Are there any illustrated educational books to console them from what they are going through in real life? These children have to live in very bad health environment and most them were traumatized by the situation. Can we produce posters, booklets that the kids rely on, that they can learn from? Anything? UNICEF produces very informative posters for the schools here (info on washing hands, eating hot foods, using proper toilets etc). Please send us any suggestion. MSNA group went to Twante area on 31 May 2008. The villages we went to are called Mya Kan Thar Village (306 families) and Aung Zedi Village (76 families). And in Dala Township, the village we visited is called Da-note village. We had rice, onions, eggs, fish cans, salt as food items and books, pencils, rulers, erasers, rain coats and clothings from Moegyo. Other donors also donated for uniforms, and shoulder bags for school children. Twante itself did not have much damages. Like in delta area, the small villages surrounding the town are hardest hit when the storm surge swept the villages. The death toll is relatively low in this area and many houses still standing. 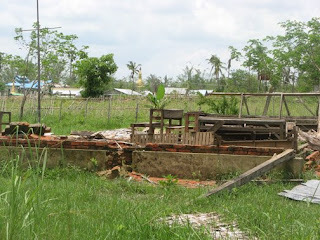 But aftermath of cyclone Nargis here is as dreadful as everywhere else. The villagers' lives evolve around farming (people are either farmers or helpers to the farmers), and fishing cottage industry. Because the rice farming season is halted, jobs are scarce in the villages. Some villagers made attempt at being day laborers in the construction sites in nearby towns, but only a few are continuing their construction projects. When we get to the village, the villagers, mostly women, quickly lined up near a little shelter where we placed our rice bags and other donated items. No one wants to be late for lining up. Getting a portion of rice and other food items mean a meal for the family while the men go out there to look for jobs. Among the pushing, rice rationing, the heat and all other bouts of such event, we were thankful to be there to help them. When you know you have helped a family, or many families, there is a chilling happiness that ran through you? We had that. And we like to share this feeling and many heartful thanks that we have received all throughout the day to all parties involved in Moegyo and many donors behind them. Schools started today in Myanmar, June 2nd. On my way back to office this afternoon in Yangon, I passed through one high school. Since today is a first day in school, parents were there to drop off the children in their cars; school children with nice school dresses were smiling and glad to be with friends and to be back in school again. Seeing school children in white and green school uniforms is always a pretty scene to me. But today, I could not enjoy the pretty scene because my mind was racing back to the villages. I was thinking about those little kids I have just met in the weekend. Back in Mya Kan Thar village, I had talked to some kids in the village, about 5 - 6 years old. They knew that they were going back to school on Monday and were happy about that. One kid told me he was in first grade. He already had a text book and an excercise book for the school. He seemed confident. Another girl next to him, eventhough her mommy had not bought her any excercise book yet, she was also looking forward to the school days. She wanted to practice her writing. That afternoon, we handed the children a white and green school dress uniform, an excercise book, a ruler, an eraser and a shoulder bag. All schools in the villages we went on that day collapsed during the cyclone. And as always, monasteries are there to give shelter to the children, and ready for becoming a temporary school for the coming months. So, today on June 2nd, the kids from the villages will be attending school in a make-shift classrooms in the monasteries; they will be practicing their writing with the books that MHF has arranged for them. That is a happy thought for the day! During the past 4 weeks, we have heard many heart-breaking stories, seen many devastation, and shared the sorrow with the victims. What touches me the most is to see the victims' strength and courage to overcome this difficult moments, and the strong will to move onto the next phase - to continue building their lives and communities around them. 2. 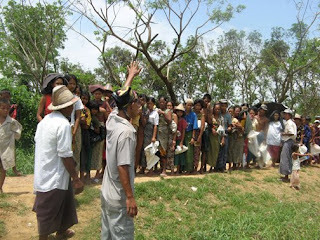 Aung Zedi Village, Twante (76 families). We were running out of time, so we donated things through village leader in front of all villagers. 3. Da-note village, Dala (over 2,000 people). The families were living under the monastery until a few days ago. Now they all went back to their homes, the chief monk tried to organize building and putting roof over the huts for 80 something poor families. He is obviously relieved and happy to see that we have brought books, and etc for the school children. There will be about 350 kids who will come under his monastery roof for schooling. We got here late, so we offered the donated items to him, he took note of everything and will distribute them equally.